I forgot to screen-shot it, but according to the wiring diagram and connector pin-out, there are only 3 wires coming off the head light switch: power, ground, and CANBUS. That's what leads me to believe that if the correct switch is in place, and all the wires seem to be there, then it should just be a software issue. I see the three wires coming off the switch, but what are the other pins on the switch for? Last edited by locutist; 05-05-2018 at 06:22 AM. locutist, your picture didn't load. Here's the screen shots of the headlamp switch assy. Also, the reason for all the unused pins is the pigtail part # is used in a lot of different models for a lot of different purposes. I have everything connected. The led tails do function properly, however, I am still not getting the rear fog to come on. Neither does the indicator light on the dash. These led tails also cause my front led marker light to stay on, dimly lit, while the car is powered off. I will replace the front side marker led back to the original and see what happens to it. Any ideas on what settings need to be made in FORSCAN or FoCCCus? Edit:I switched the front led side marker back to normal oem bulbs and they function properly. I still need some help with Forscan. Last edited by locutist; 05-09-2018 at 06:56 PM. *shrug* Have you searched the Forscan forums? If you're using FoCCCCCCCCCCus, I think I remember seeing someone show in this thread where in the program to "activate" rear fogs. Maybe it was in a FoCCCus thread? Well, that is a bummer. 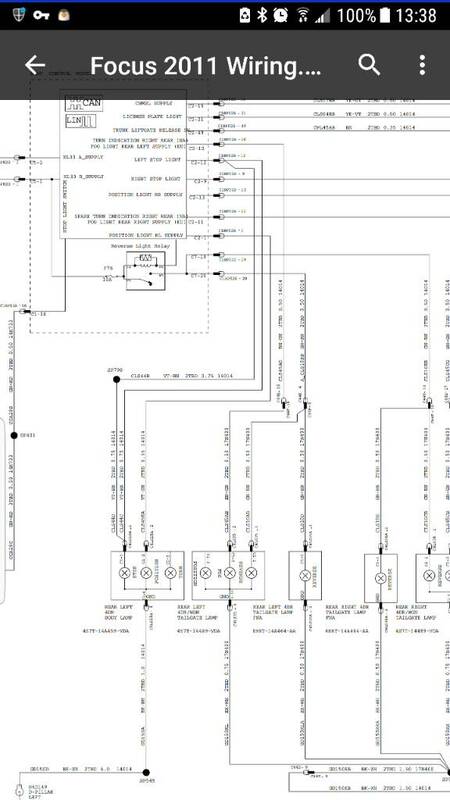 Can you share the schematic you found? When I looked at the owner's manual from Ford.co.uk I didn't see a fuse location in the BCM panel for rear fogs. Did I overlook it? My searching skills are horrible, but I'll keep looking. I also noticed that my fog light wires don't match what you have posted above. As you can see, the rear fog is a direct wire to the bcm. That specific output on the bcm is used for the rear turn signal on NA versions. Thanks. I'll work with this and see where it gets me.